Why on earth am I dragging my art cart or trolley for you guys overseas four thousand miles to Alaska. Well I love this cart we have been together several years now. BAC- Before Art Cart. 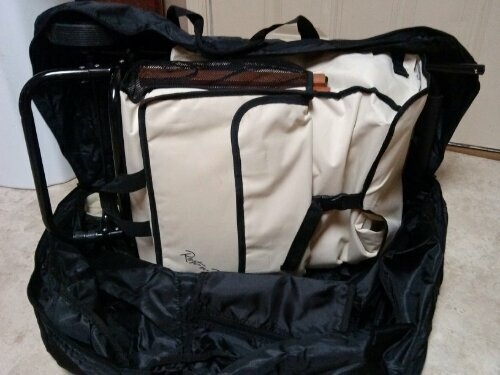 I tried tote bags, boxes, paper and plastic grocery bags, milk crates on wheels, rolling backpacks, scrapbooking carts and the list goes on and on. Some I bought, some people gave me or lent to me, on sale or not on sale. Talking to other cart owners at conventions, stopping cart people on street. Going to workshops, art classes and conventions carrying my supplies up steps, in elevators and back and forth to car was killing me. This was a crazy back breaking obsession to find a better way. After I really hurt my shoulders at a convention and a couple months later pulled a couple of ribs out of place. I finally found my true cart love- Rest and Roll Trolley. This cart is like a good spouse, you think of ways you could change it, but all and all you are so happy with what you found. What is so great about this cart. #1 reason I love this thing is the fold out chair, that a full size human being can sit on comfortably and it ROLLS off road too. Now for the nuts and bolts of this cart. QVC discription– One smart cart. From around-the-house use to away-from-home-excursions, the Rest-n-Roll cart is designed to simplify life. Carry anything from groceries to a change of clothes in the large, multipurpose storage bag, then, keep drinks and munchies in the insulated pouch. 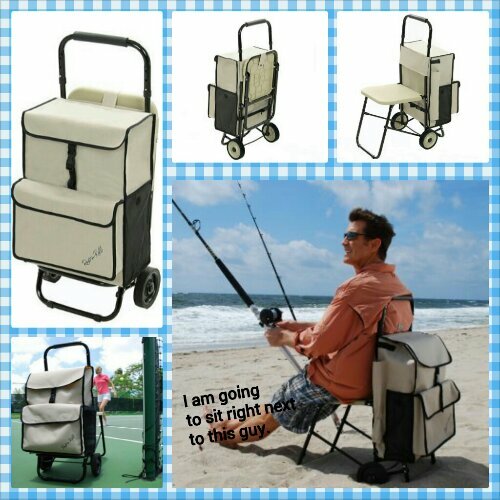 There’s even a there-when-you-need-it, comfortable, sturdy, flip-down molded seat.,Extendable handle,Durable, lightweight polyester construction,Open, measures 26″D x 37-1/2″H x 16″W; supports up to 300 lbs, Made in China. If you want a good laugh: watch the you tube videos for this product. Well how much can this cart hold. 2 wood palettes, 4 wood brush boxes, medium wood paint box for oil tube paint, 2 plastic travel palettes for wet paint, small tote bag with turps, gamesol and other flamables. Funnel, wet canvas holders, mixing tile, and two aprons. Pockets inside and out are stategically placed for good use- umbrella pocket, small tripod pocket. Came with a snap on pencil case- I have been thinking about what to put in it for 2 years..lol. To top it off, the front of the bag has a insulated pouch for drinks, lunch and snacks. Our trip to Alaska will be a sketching watercolor trip, so I will update later on the packing list. Now, the big dilema it to fit it in my suitcase and not be over 50lbs. .It folds up nice, take wheels and handle off, i think it fits in my suitcase. ….I hope so at least…..